We are entering the Twilight Zone: Bitemarks can now prove innocence? No one escapes the Twilight Zone. 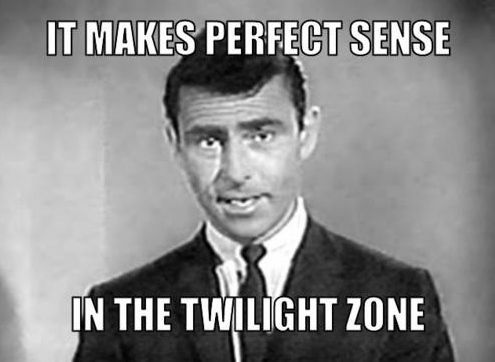 The Twilight Zone is an American television anthology series created by Rod Serling. The episodes are in various genres, including psychological horror………. The Politics of Forensics in the US is Alive and Well. Here are the players. The NDAA is the US District Attorneys national group. The AAFS has a significant percentage of law enforcement crime lab employees in its membership. The Forensic Specialties Accreditation Board FSAB makes forensic groups “official” and gatekeepers for their disciplines. The crime labbers and others need certifications to meet employment expectations. Each ‘specialty board’ is self governed. This org certifies the bitemarkers. Hundreds of US crime labs are certified by the ASCLD and a few other ISO 17025 compliance businesses. Most of the examiners have a background with law enforcement. Unfortunately, many US crime labs noted in the media for various scandals have been certified. The news media and public are now quite aware that there is more to this story. Here’s another part. You now in the Twilight Zone. I’ve been thinking about the NDAA president’s recent illogical support saying bitemarks in criminal investigations and court are capable of determining whether a person is NOT guilty of violent crime as being shockingly stupid. According to him that means the bitemarkers can tell the police who is innocent of crime. Just like DNA. Incredible. For forty years they told police who was GUILTY without scientific reasoning which resulted in at least 24 wrongful convictions. But now they have credibility to say who is INNOCENT? Besides all the above, here’s another piece of the pie. I’ve recently been given the worthy opinion that any expression that the American Academy of Forensic Science’s has a “certifying” connection with the FSAB is a violation of the AAFS Code of Ethics. Considering my past dustups with some in the AAFS, and the bitemarkers, I’m rather concerned and somewhat confused both from the source and the message. But, regardless of this, I will continue thinking. FSAB has alot of AAFS heavy hitters on its ruling board of directors. Here is a reasonable question to the ask in the public interest. Could this relationship having any bearing on bitemarkers’ continuing survival? Could this merely be a coincidence? I suppose the NDAA beliefs will have a chilling effect on this part of forensic science reform regardless of who is in on the FSAB decision making. In any event, the bitemarkers have their FSAB approval up for re-certification in 2018. Its up to FSAB to show the public that the Tx Forensic Commission, the NAS and PCAST will not be ignored. This entry was posted in AAFS, ABFO, Bite Marks and tagged American Academy of Forensic Science, AMERICAN BOARD OF FORENSIC ODONTOLOGY, Forensic science, wrongful convictions. Bookmark the permalink. 1 Response to We are entering the Twilight Zone: Bitemarks can now prove innocence? One of my favorites. The AAFS needs to stand up to the bitemarkers. In public and with no double-speak. Scientists needs to ‘rise-up’ despite Jeff Sessions and WH dogmatic medievalism.